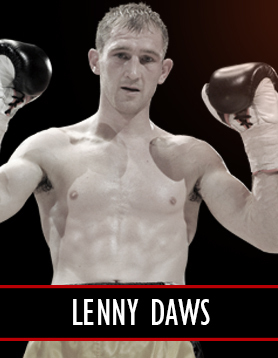 Morden’s Lenny Daws has been a professional boxer for over eleven years now. He’s won various domestic honours, including two British light-welterweight titles, and has fought a who’s who of the 10-stone division. He’d be forgiven for taking his foot off the gas and drifting into retirement. But, quite the opposite, Daws is currently as ambitious and as driven as he has ever been. What’s more, his attention is now focused above and beyond domestic honours. He wants the European light-welterweight title. And then he’s gunning for the world. Daws, of course, first rose to prominence on the BBC under the guidance of promoter Mick Hennessy. He’d often feature on fight cards alongside the likes of future world champions Carl Froch and Darren Barker. He’d impress viewers with his high-octane, swarming style and relentless pace. In his thirteenth fight, Daws lifted the Southern Area light-welterweight title with an impressive ninth-round stoppage of Colin Lynes, a leading domestic campaigner. He then went one better in May 2006, beating Nigel Wright on points to lift the British light-welterweight crown. The reign didn’t last long, however, as Daws, in his very next fight and first defence of the title, dropped a decision to Scotland’s Barry Morrison and watched helplessly as his title changed hands. Still, two years and eight months later, Daws, having won a number of fights in between, was given a shot at revenge. He faced Morrison for a second time. The vacant British light-welterweight title, his old belt, was on the line. This time Daws wouldn’t be denied. He broke Morrison apart and stopped him in the tenth round of a rousing affair. He was again British champion. Successful defences of the title against Jason Cook (draw) and the unbeaten Stevie Williams (tenth round stoppage) followed. Then, in February 2011, Daws lost a unanimous decision to Ashley Theophane and again sacrificed his belt. Far from that denting his confidence or ambition, though, it only served to further motivate Daws. Indeed, in October 2010, he comfortably outscored Ville Piispanen over the 12-round distance to lift the EU light-welterweight title. Lenny was now back on the map. He was on the hunt for bigger and better things. And so, in June 2013, he ventured to Puglia, Italy to face Michele Di Rocco in his home country. The European light-welterweight title was at stake. Daws, a considerable underdog going into the fight, put up a sterling effort and seemed to better Di Rocco every step of the way. But that didn’t stop the ringside judges scoring the fight for the Italian. Nor did it stop Di Rocco going home with the European title. “It has been very hard to get over that,” said Daws. “I’ve had a little look at Di Rocco again, and seen what he’s been up to since we fought, and he’s high up there in the rankings now. He’s on the cusp of a world title shot. That’s where I should be really. I should be European champion now. “But that’s all in the past and I’ve moved on. The European title is still very much in my sights and I can still pull it off. It’s a belt I’d love to have.